Investment Websites revenue from AdSense, Amazon, etc. 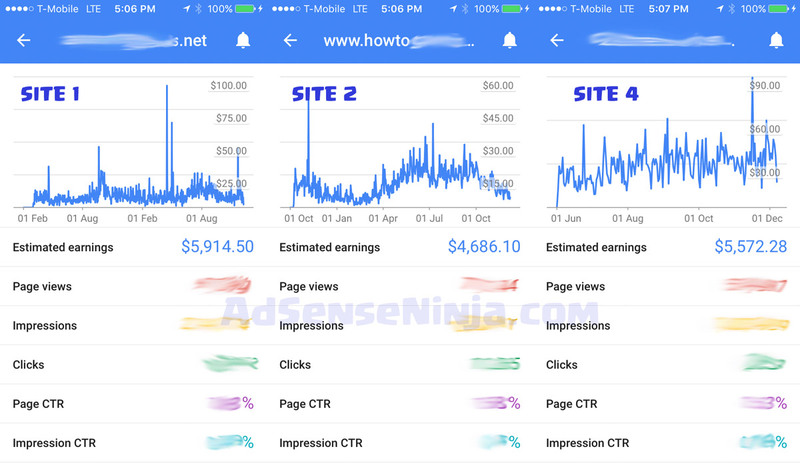 Hey AdSense Fanatics – today I’m starting my Monthly Income Reports series to share with you how much I’ve made with my Investment sites (websites bought on Flippa or through private deals), and to give you motivation! This report is intended to show that ANYONE can earn decent money, and even living, by either building out their own sites OR buying an already earning website. 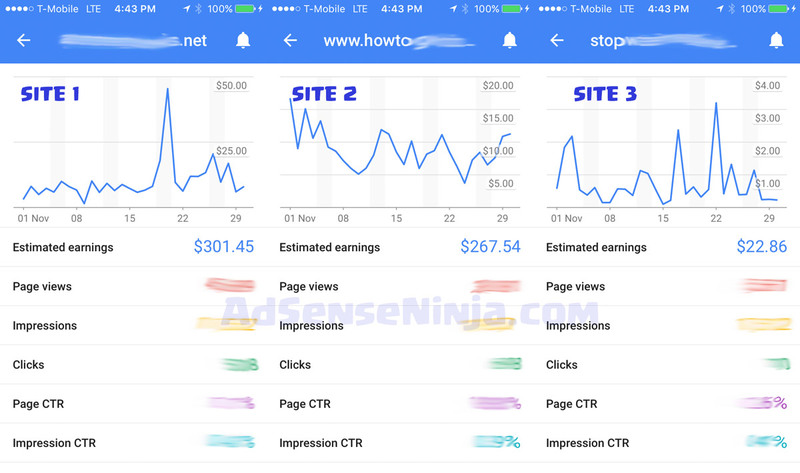 So I don’t have time to build new sites, because I’m very busy with my main 2 projects, but I want to stay in the game – and build a portfolio of AdSense earning site – so I just buy them. I will make a separate report on how I invest in sites, and I did so already here and here, as well as my new investment – first website that I bought for more than $10. So now let’s look at how much I made in November with ALL my investment sites. But enough with theory – let’s see the beef! My combined investment sites income between AdSense, Amazon and Lead Generation affiliate program from ALL my investment sites (bought on Flippa or through brokers) was $2292.77. Just to put that in perspective, my mortgage is $1552. So my investment sites pay the mortgage and taxes on my house! To put it even more in perspective – my total purchase price of the sites that contributed to this monthly income, was $21650, which means these sites will pay for themselves in 9.44 months! At this rate, it is an annual income rate of 127.08%! So investing around $22K in websites, pays the mortgage and taxes on my house – just think about the possibilities!!! Now – the PROOF screenshots, in case some of you are skeptical. 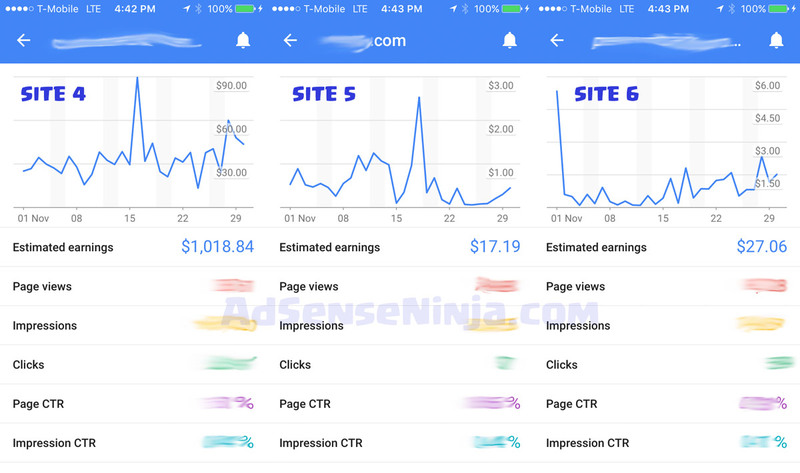 I will only include AdSense income, because Amazon is easy to fake, and my Lead Gen is a private deal, where I get paid by check, and my statistics include many other sites that I did not buy, but rather built myself, and I don’t want to disclose how much I make, outside of Investment Sites. So I have total of 6 investment sites that I bought before Nov. Here are November income screenshots. I will also include total income for top 3 sites in the end of this post. Sites are listed in chronological order (oldest to newest). Ok, so AdSense is the king here, but as I’ve talked about in my Amazon vs AdSense post, Amazon really shines when you “sell” high ticket items, while my Amazon income is based on average item cost of $21.13. So if you refer more expensive products ($50+), them Amazon is definitely the way to go and it WILL earn more than AdSense. I will make this really interesting and include Purchase Price of each site, as well as total income to date, so you can just see the potential. I will do this because total purchase price of $21650, does not show when site was bought and how much it has earned. Also it is important to show this, because some sites are seasonal. One of my best performing sites earns $200/mo in the winter and near $1000/mo in the summer. In the matrix below, I list sites in the order I bought them. OK – this is eye opening even for me, since I’ve never done this math before. Basically, in aggregate, these sites have already paid for themselves! It’s hard to calculate combined Annual Income Rate for them because they were bought at different times, but on average (days per dollar paid), I’ve owned these sites for less then 1 year, so my ANNUAL RETURN ON INVESTMENT is over 100%! Try beating that with stock market or putting your money to the bank at 1% APY … lol. Also, somewhere in the math I made an $8 mistake … oh well. Please note that I did not include in this table my two newest purchase, 2 sites that I acquired in late November and early December of 2016 for $2551 and cool $10000 respectively. I am still working on cleaning them up, but WILL include them in December Monthly income report! So as I mentioned in the beginning – this is not to brag about how much I make. 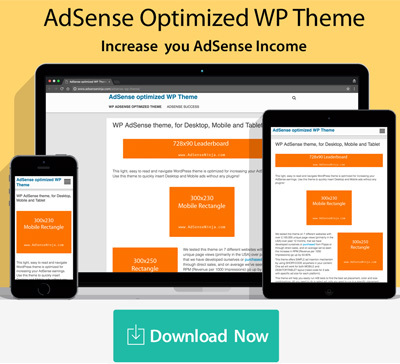 This post is to MOTIVATE all of you to either start a website, or if you have one already – optimize it, and increase your AdSense revenue. Or invest in them like I do. i don’t have time to build new sites, so I just buy them with traffic, that earns me money. But whatever you do – stop procrastinating! CAUTION – Investing is websites involves risk of losing your money! If you don’t know what you are doing – don’t go running to Flippa and buying a website. Most sites on Flippa (over 95%) are junk or a scam, and you should VERY carefully select and verify the site you want to buy!!! It is a complex process that I will be explaining later on this blog and in my AdSense Success course on Udemy. But keep in mind you can loose all the money you invested in the site, and even risk getting your AdSense account closed / disabled for life! So you absolutely need to understand what you are doing! As an example, I managed to by a website with FAKE Google Organic traffic. Good thing I only spent $700 on it. Another site in my list above (Site 6) – I grossly overpaid for it based on fake earnings screenshots from seller … that’s why it’s not earning on the same level as my other sites (about 50% APR vs over 100%). 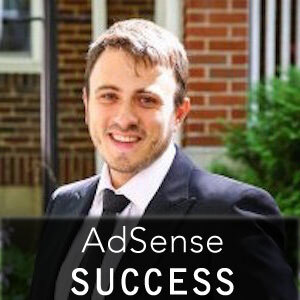 If you buy a site with fake traffic and fake clicks, it is VERY likely that google will disable your AdSense account – probably permanently. Google is very proactive in keeping their horde clean, and weeding out bad publishers. So be be very careful investing in websites, until you 100% understand the process. I will make a bunch of blog posts on this topic as well as videos on my AdSenseNinja YouTube Channel. Good luck to all, and happy AdSensing!